Welcome to Today@WKU, the daily newsletter from WKU Public Affairs, for October 2, 2018. Herald, Talisman finalists for three national Pacemaker Awards: The College Heights Herald and the Talisman are finalists for three national Pacemaker Awards in 2018 – College Heights Herald – newspaper Pacemaker finalist; WKUHerald.com – online Pacemaker finalist; and WKUTalisman.com – online Pacemaker finalist. In addition, 16 students on the staffs of the Herald and Talisman are finalists for ACP national individual awards in nine categories. WKU Week in Photos: Sept. 24-29, 2018: Check out the latest installment of WKU Week in Photos by Clinton Lewis and Bryan Lemon of WKU Public Affairs on WKU's Facebook page. University College Grants Research/Creativity Award to Professor for Creative Works: In spring of 2018, University College awarded Dr. Cheryl Hopson the Faculty Award for Research/Creativity within her department of Diversity and Community Studies. Chosen for outstanding contributions in her field, Dr. Hopson is a self-identifying poet scholar; she has written four published journal articles, a poetry collection titled Fragile, and published 11 poems in various publications. 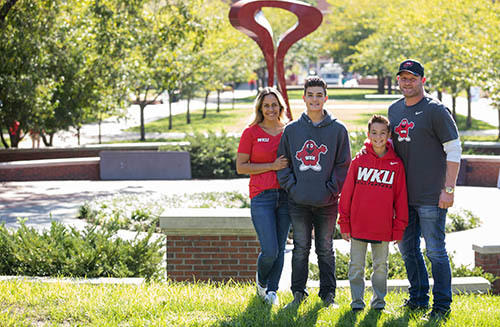 Athletics: Micatrotto Family Makes $1 Million Gift to Support WKU Athletics: WKU has received the largest outright gift from a former student-athlete with a gift of $1 million from Joe and Sunshine Micatrotto of Las Vegas, Nev. The Micatrotto gift includes support for capital projects, the WKU Football and Volleyball programs and the WKU Opportunity Fund. Volleyball: Rachel Anderson Selected as Senior CLASS Award Candidate: WKU Volleyball's Rachel Anderson has been named as one of 30 NCAA Women's Volleyball Senior CLASS Award candidates. To be eligible for the award, a student-athlete must be classified as an NCAA Division I senior and have notable achievements in four areas of excellence: community, classroom, character and competition.